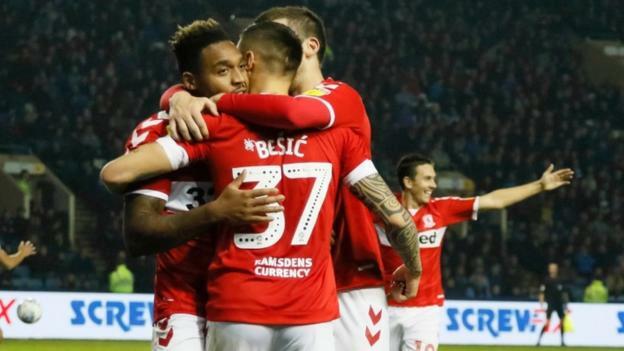 Mo Besic and Britt Assombalonga got the goals as Middlesbrough hung on to beat Sheffield Wednesday and return to the top of the Championship. After a poor first half, Boro hit the Owls with two goals in six early second-half minutes – one beautifully worked, the second self-inflicted and both involving on-loan Everton midfielder Besic. First, on 49 minutes, Stewart Downing’s cute backheel down the right side freed Jonny Howson and, from his pull-back, Besic took on Tom Lees, twisted and turned to create an angle, then slid home a low, angled right-foot shot from 12 yards. Then, on 55 minutes, Lees panicked under pressure and passed straight to Besic who powered forward before squaring to his right as keeper Cameron Dawson came out and Assombalonga kept his cool to score his fifth goal of the season. Former Boro man Adam Reach, who had clipped the bar in the first half with a header from Barry Bannan’s cross, gave his side hope with an 82nd-minute volley from 20 yards. And the visitors had to survive an almighty last-minute scramble on the line in an incident that could have gone either way as bodies piled up like a rugby ruck. But Tony Pulis was the manager who came up smiling as his side edged above morning leaders Sheffield United on goal difference heading into Saturday’s fixtures. Wednesday, who were without Italian playmaker Fernando Forestieri, did create the better first-half chances, with Reach also seeing an angled right-foot shot tipped wide by Darren Randolph. And, late on, they also had a header by substitute Atdhe Nuhiu blocked on the line, prior to that frantic scramble. The Owls might also claim the outcome would have been different had Daniel Ayala been sent off just after Boro had gone 1-0 up, when he appeared to elbow Steven Fletcher in the face. But, equally, on a night when Wednesday surrendered their unbeaten home record, Besic had chances to win it by more for Boro. On another rapid counter-attack, he opted to go for goal rather than again square to the better placed Assombalonga, and he was again denied when a curling shot deflected wide off Nuhiu. Boro have now not lost in 68 Championship matches when they have held a lead – a run going back to March 2015 against Nottingham Forest. “You are playing against one of the best teams in the league. Physically, they are unbelievably strong defending. “They do not give a lot of chances. In the first half, we had the best chances to go in front. “The game should have been out of sight. You’re controlling the game and, from nothing, they’ve suddenly got a goal from nowhere and they sniff a chance. “In the end, that one stayed on the line. I don’t mind how we kept it out as long as it didn’t cross the line but we should have never been in that position. We have to see games out better. Next articleFacebook’s fight against fake news is actually working. Sort of.